As the winter season continues, the southern areas of Pakistan have been under the grip of a, well a “heat wave” though not a real one, since the last 12 to 14 hours. Maximum temperatures have started to rise and it is already feeling as if the winter season has come to an end but it has not. The temperatures in the south-western city of Karachi is already hovering around 30°C during the afternoon as it is near the coastline. However the northern parts of the country are still in the grip of a chilly weather as a cold weather pattern dominates the area that has been blowing cold winds and causing rainfall/snowfall there but the question is that why is southern Pakistan experiencing such an unusual weather? Causes of this “Heat wave”? A strong anti-cyclone has formed in the northern Arabian sea that is acting as a shield and blocking moisture as well as cold winds coming to lower Pakistan. The anti-cyclone will also influence the weather over some central parts of India due to which temperatures would also rise there and the rainy cold weather system would only be able to affect northern Pakistan and north-western India where it would intensify further. This anti-cyclone over the Arabian sea is likely to stay for four to five days during this period the maximum temperatures would rise as dry hot air will penetrate through southern areas of the country. Thus, winds could gust up to 30 miles per hour with some passing clouds over lower Sindh. It must be noted that these winds are blowing in an opposite direction that is West or South-West, a summer-like pattern, against the usual winter winds of North-East. In Karachi city, the maximum temperature was 36.1 °C on February 25, 1996. In Hyderabad, the maximum temperature was 38.2 °C on February 16, 1993. In Nawabshah, the maximum temperature was 38 °C on February 26, 2004. 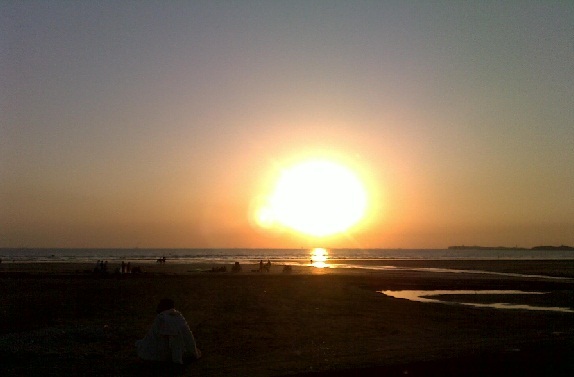 In Gwadar, the maximum temperature was 33 °C on February 27, 2008. It is easily observable that temperatures tend to rise during the last days of February indicating that summer is approaching. But wait! ‘New’ Cold wave to battle with the existing heat wave? The existing trend of high temperatures would remain till February 22/February 23 in southern Pakistan during this period the maximum temperature in Karachi could reach from 27°C till 29°C, after that the day time temperatures would start to decrease. 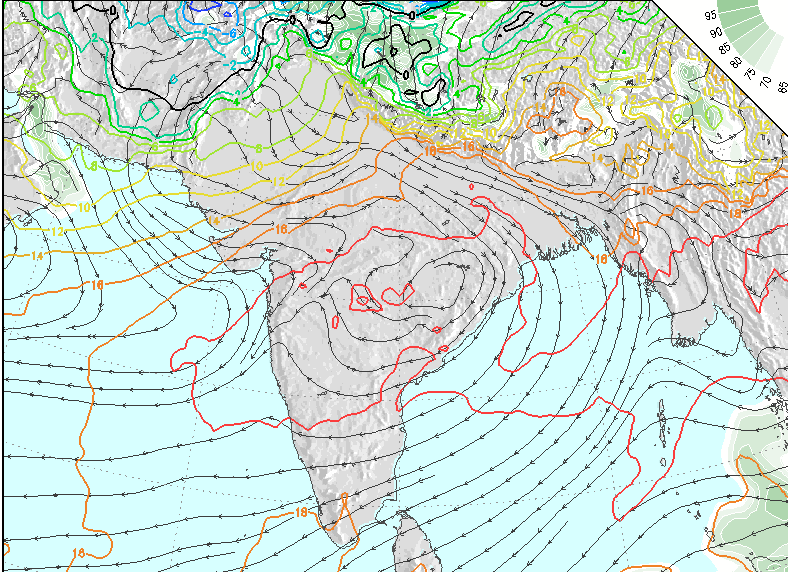 The decrease would occur as the anti-cyclone would mainly influence the central parts of India including the coast of India, this anti-cyclone would grip central coast of India including some mainland after 120 hours (see the above image) by then the temperatures would start to decrease in southern Pakistan. The existing rainy weather system as it would start move towards India on February 21, it would be followed by a cold wave (mild) that would force its entry into southern Pakistan on February 23 as the weather system in the Arabian sea would start to fade away. Due to which the temperatures would once again start to drop over many parts of the country till the weekend at least. In the end, it is worth mentioning that this winter season has been an extended one! ← Europe’s cold snap: What is North America doing? What is the reasonbehind the climatic change, the extreme cold weather in Europe, a cold spell in Karachi, and now this heat wave? If global warming is false, then what are the main reasons behind this? Climate change is happening around the world and it is a cycle of Earth’s climatic pattern, we could ignore Karachi’s event as they were on small scale but cant ignore the historical weather events that took place in Europe.